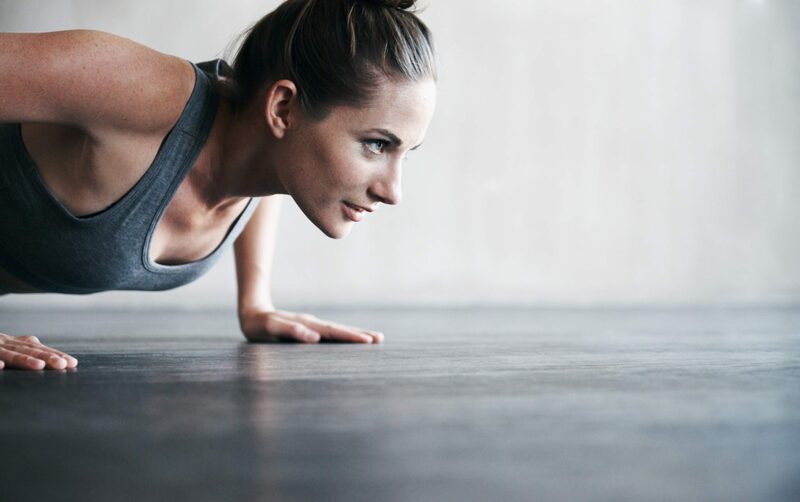 Push-up is an amazing body weight exercise which can be successfully used to record your physical strength. If there's a reason you need to take a body strength test, you may be wondering, how to do more push-ups and get a better evaluation. But before that, you have to know what's your base line. To increase the number of push-ups you have to count the number of reps you can accomplish in a set period of time. To get started with your personal evaluation you have to make sure you know how to do this exercise correctly. Start on all fours, place your hands slightly wider than your shoulders. Extend your legs straight and curl your toes firmly on the ground. While balancing your body on your palms and your toes, keep the rest of your body, from head to toe, straight as if forming a single line. For a typical push-up, keep the legs close together. Before doing the actual push-up, make sure you engage your whole core. Clench your glutes and let your abs contract and hug the spine. Keep it that way throughout your workout. Inhale and start lowering your body by bending your elbows until they form a 90 degree angle. Keep the elbows to your sides. Hold for a few seconds. Exhale and start pushing yourself back up by contracting your chest muscles. When you reach the top, don't lock out your elbows, but keep them a little bit bent. If you want to know how to do a lot of push-ups, you need to find out how many can you actually already make. To do so, set the timer for one minute and try to perform as many proper push-ups as you can. There are two options for how you can optimize your spurts. If you're a beginner, try to take short rests every 10-15 seconds. This will prevent you from dropping down too soon with fatigue. If you already have a fairly good physical form, try to keep pushing in a consistent pace for 30-45 seconds, then take a rest for about 5 seconds, and do as many as you can to the finish. Follow these steps to increase your initial base line. Start by doing push-ups regularly. You can start with 2 times per week and eventually exercise every other day, which is optimal. Resting days are crucial for your muscles to repair themselves. Always warm up before your training. Jogging, bicycling, or using a jumping rope are all great ways to prepare your body for the workout. Stretch your chest, arms, shoulders, and back before you start. For the first week, aim to do 3 sets of your current base line number. You don't need to follow the timer now. Allow yourself 2-3 minutes of rest in between the repetitions. After four weeks, test yourself again and see how many you can do in one minute. If it's difficult for you to perform even a few push-ups, try some easier variations. Build your strength by doing an elevated version with the help of a table top, a wall, a stable box, or other piece of furniture or equipment that is significantly higher than the floor. Work on your core engagement and proper spine alignment by doing your push-ups on your knees instead of the balls of your feet. It's also a good idea to target the muscle groups that are most active on this body weight exercise with other workouts. Work your shoulders, your arms, your chest, your abdomen, and your back. But don't neglect your lower-body muscles too. 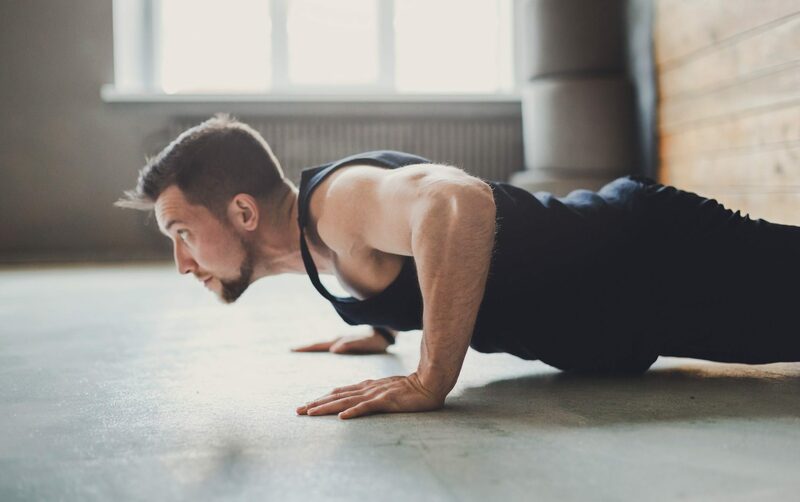 It's wonderful if you can end each of your push-up training with a plank, staying in this position for as long as you can.